Legend Secure’s video service includes cloud storage, instant video alert, constant high definition recording, smart clip capture, and anytime live streaming. Never miss a moment, so you’re always prepared to act. Using your phone, tablet, or computer you can watch live video from any of your cameras. Control the pan and tilt abilities of the cameras from any device, allowing you to see every view possible. High definition video and excellent lowlight performance provide you with beautiful video of your property. If you have systems in multiple locations, you can simultaneously watch video feeds from all of them at once, on a single screen. Already have video cameras? 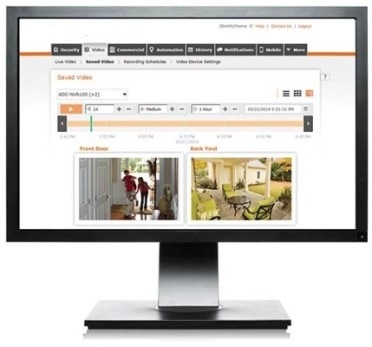 Legend Secure’s system seamlessly integrates with virtually all cameras. Receive instant alerts and video clips when something is happening. In the event of an alarm going off, your system can immediately send you video by text or email so you know exactly what’s going on. When the alarm is set off, the system automatically captures video footage from before, during, and after the alarm event giving you a total view of what’s taking place. You can also set sensors to capture important activity such as doors or windows being opened, or if motion is detected. This allows you to always know who is going in and out of your home. Using your system’s geo-services, you can configure your cameras to always record when you are out of the house, but not when you’re home. This can be set separately per camera, giving you full control over what your cameras capture. Thanks to an easily searchable video library, you can go back and see every event from any time. You can also sort by activity type, allowing you to quickly find what you want to watch.